The interventions by the US and its allies in Iraq and Afghanistan were on a massive scale and came close to failure. In the thirteen years of fighting there were 250,000 civilian casualties (dead and wounded) and 35,000 casualties among the US and allied forces. Drawing lessons from these wars is key to understanding the future of warfare, with the caveat of the old adage of the dangers of “generals fighting the last war”. 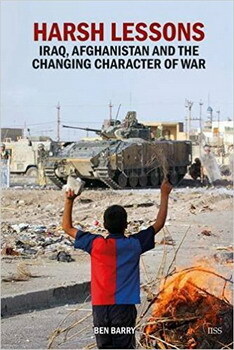 This short book by Brigadier (Retired) Ben Barry, who is the Senior Fellow for Land Warfare at the London based International Institute for Strategic Studies, is enormously useful as a way of coming to grips with the future likely character of warfare. The book could help military planners and strategists in the intervening powers as well as other to think of the capabilities needed to fight the next war. Intervening militaries from the US and its allies now perform everything from fighting to “nation building under fire”. In the late 1990s US Marine Corps General, Charles Krulak, described the “three block war” concept where Marines might be involved in full scale military action, peacekeeping, and humanitarian aid within three city blocks. Barry believes the future might involve “n block wars”, where n is the number of different types of activities, which could be even wider in range. In these two wars the US and its allies came close to “strategic defeat,” he writes. They were only really saved from defeat by the surge in forces that took place well into the wars. In the wake of some wars some of the Generals often complain that they were not given enough troops or time, and hamstrung by the politicians. There is recognition that density of forces made a difference and that some allies were restricted in what they could do, but this is not the core of Barry’s case. Leadership, reconstruction efforts, political strategy, military strategy, operational concepts, and equipment were inadequate. There were failures “at every level” to adapt quickly enough to unforeseen circumstances, such as the use of IEDs and the mistreatment of prisoners, which gave opportunities to the insurgents. “It took years for the US and its allies to sufficiently understand both conflicts,” Barry writes. Innovation by the US and the UK was slow and encumbered by large defence bureaucracies. By contrast the insurgents were quick to adapt their methods. The successes of the two campaigns were the initial offensives to bring about regime change and, in the case of Iraq, the US move to support the Anbar Awakening of the Sunni against al Qaeda. If there is one overriding message from the book, it is to reinforce what Clausewitz said – that war is and always will be an inherently political process. The importance of understanding local politics would have helped the intervening powers avoid such pitfalls as breaking up of the Ba’ath Party and the army. The question of what after regime change was hardly addressed at the outset. Soon after the US declared what was tantamount to victory, insurgencies exploded in both theatres. Both the US and UK had neglected the counter-insurgency doctrine and had to re-learn what had been learned in Vietnam and Northern Ireland. From the disasters a host of lessons emerge. There is a need for improved intelligence and political understanding, as well as a case for armed forces to retain their own development and reconstruction experts who can operate in hostile environments from which civilians had best stay away. The necessity of maintaining and developing a counter-insurgency capability was brutally reinforced by these conflicts. Barry also argues that armed forces must ensure that they can win the battle of the narrative through electronic and information warfare in the age in which social media is dominant. In military operations, the wars showed the value of Special Forces in conducting counter-insurgency operations and in training. Iran used its Quds forces in Iraq to wage a proxy war through support of Shia extremist groups. Other lessons from military operations in these campaigns showed that infantry remains a key capability especially in urban areas and mountains. However, the improvements in infantry protection do restrict mobility. Armoured vehicles will continue to perform a key role. Artillery was also effective and the fighting in Ukraine, Syria, and Iraq has shown its continued importance. The great advantages of the US and its allies in Iraq were their overwhelming air superiority and uncontested use of the electromagnetic spectrum. In future conflicts it is highly unlikely that any force will enjoy these sorts of advantages. Russia places an enormous emphasis in its military doctrine on electronic warfare, and means of bringing down UAVs are fast developing. For countries that might fear invasion or intervention, the main lesson of the war could be the failure to deter a foreign power. That could mean more investment in anti access and area denial systems. Planning for a fall back position on an insurgency once the conventional army has folded could also be a lesson for many and drive an investment in irregular forces. The two wars have generated a public distaste in many countries for boots on the ground intervention. That makes intervention a less likely policy option for many countries, meaning that interventions when they do occur will have to be quick and limited. An associated lesson from such interventions might be that regime change without successful stabilisation could bring about a worse situation than the preceding one. For most forces, the overriding lesson to be drawn from the book is the need to quickly understand an environment and to rapidly adapt.